With just about every movie at the theater today having a number after it or being a remake, I found myself eating chicken nuggets at “The Hangover Part III,” and it was surprisingly good… the nuggets, that is. I wanted to laugh, I really did. I liked the first one, and even the second one was a hoot. I know these movies are where farce meets fantasy, and the sight of our friends in impossible circumstances can make us howl with laughter. The previous two movies felt almost natural as they led us down the path into Hell. This third edition is so contrived, they had John Goodman (The Big Lebowski) show up 10 minutes in to explain the premise. Up to that point we were treated to nothing but death and destruction. 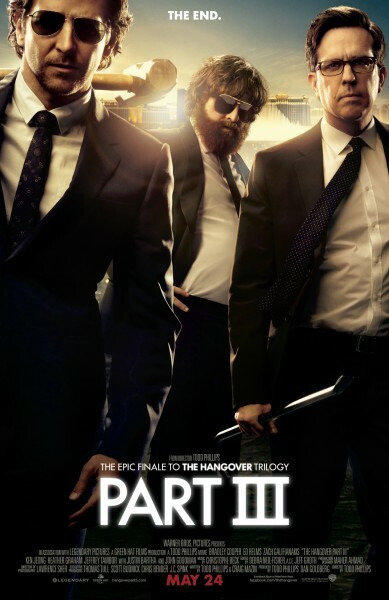 Three of the Wolfpack boys, Phil (Bradley Cooper of Silver Linings Playbook), Stu (Ed Helms of The Office), and Doug (Justin Bartha of National Treasure) are annoyed with Allen (Zach Galifianakis of Due Date) because they have to be his friend and do this third movie. They are all drawn back into mayhem because Allen has remained pen pals with Mr. Chow (Ken Jeong of Zookeeper), and Chow just broke out of his Bangkok prison. Marshall (Goodman) wants Chow and our boys have to deliver him. The modern Greek tragedy can be hilarious, when it is original. A few things you need to understand. Director/writer Todd Phillips did not write the first movie, but he wrote two and three. I do think he is a great writer with mad comedy skills, but this is just a Saturday Night Live type skit for these great characters. I had one laugh in the whole movie, and that was during the scene with Melissa McCarthy (Bridesmaids). Many people think a “formula movie” is a buddy movie, or boy meets girl, or a monster eats New York. It’s really about money, like if you have these two actors and this director, that computes to a financial success. Here they have created a new formula; a third movie will make 60 percent of what the second movie did, no matter what they put up on the screen. They got my nine bucks, and if they get yours then you will be guaranteed to get “Hangover With a Vengeance” in theaters for next Christmas. Trust me, drink heavy tonight, have your own hangover. I give this movie 1 star out of 5 and that is for a soundtrack that had Harry Nilsson and Hanson. Just “MMMBop” yourself over to “Star Trek,” if you have to go the movies.